Origin and Habitat: Mammillaria aurihamata is endemic to Mexico, where it occurs in San Luis Potosi, near Real de Catorce. Altitude range: Around 2500 meter above sea level. Habitat and ecology: This species grows in black humus among limestone rocks, under bushes. Description: Mammillaria aurihamata is a softish bodied plant that, as the name implies, has golden yellow hooked central spines, although the white radial spines tend to lighten the colour, and is particularly attractive at all times of the year. The blossoms are small, yellowish white and are followed by red fruits. It grows vigorously, offsets freely, and makes an impressive mound of heads when quite young. 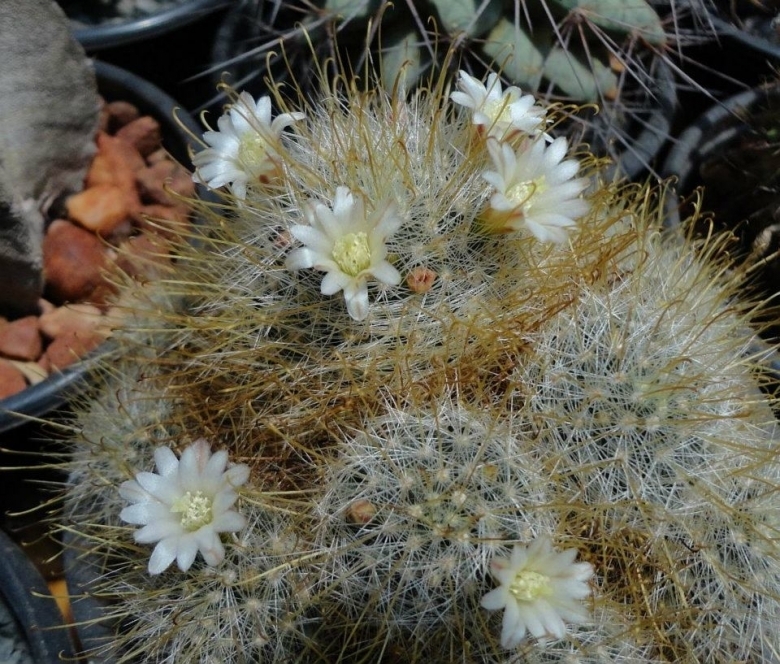 Mammillaria aurihamata is included by Hunt and al. (2006) within (as a synonym of) Mammillaria crinita subsp. leucantha, suggesting that there is not really a fundamental difference between the two. Stem: Solitary, sometimes clumping at base, globose to ovate, glossy green, depressed, the base often tuberous, 60 mm high and 40 mm in diameter. With watery sap. Tubercles: In 8-13 spirals series, shining, short cylindrical, keeled ventrally, 6 mm long and 3 mm wide. Axil with a little wool, mostly naked, but with 8 white hair-like bristles up to 15 mm long. Radial spines: (15-)24-26, 8 mm long, nearly hair-like, smooth, yellowish white to white, semi-stiff, in the upper part of the body strongly ascending, later horizontal. Central spines: 4-5, upper three 10 mm long, the lowest hooked and to 25 mm long, all slender acicular, smooth to somewhat pubescent, whitish yellow in youth, becoming golden yellow to brownish yellow. Flowers: Funnelform, cream yellowish or pale pinkish with reddish brown mid-veins on the outer petals,15 mm long and 12 mm wide. Fruits: Red, clavate, small, 8 mm long and 3 mm wide. Seeds: Brownish black, oval with lateral hilum, 1 mm in diameter often conspicuously strophiolate. 6) Hunt, D., Taylor, N. and Charles, G. (compilers and editors). “The New Cactus Lexicon.” dh Books, Milborne Port, UK. 2006. Cultivation and Propagation: Mammillaria aurihamata is not an easy plant to grow , more rot prone than most and more demanding regarding soil conditions. Watering: Water regularly in summer, but do not overwater (Rot prone), keep dry in winter. Keep Mammillaria aurihamata in very dry and ventilated place especially in winter. Hardiness: Reputedly sensitive to frost , but less so if kept on the dry side prior to, and during, cold weather (hardy to -5° C for short periods). However warmth throughout the year will increase the grower's success (minimum 5° to 8°C during rest season). - Mealy bugs: Mealy bugs easily they develop aerial into the new growth among the wool with disfiguring results, but the worst types develop underground on the roots and are invisible except by their effects. - Rot: Rot is only a minor problem with mammillaria if the plants are watered and “aired” correctly. If they are not, fungicides won't help all that much.